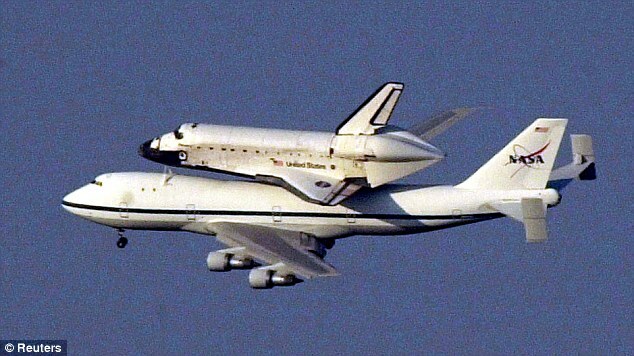 Space Shuttle Discovery, atop its Shuttle Carrier Aircraft, NASA 905, flew over the US national capital region on April 17, 2012 on the final leg of its ferry flight from NASA’s Kennedy Space Center in Florida to Dulles International Airport in Virginia, on the way to its final home at the National And & Space Museum’s Steven F. Udvar-Hazy Center. 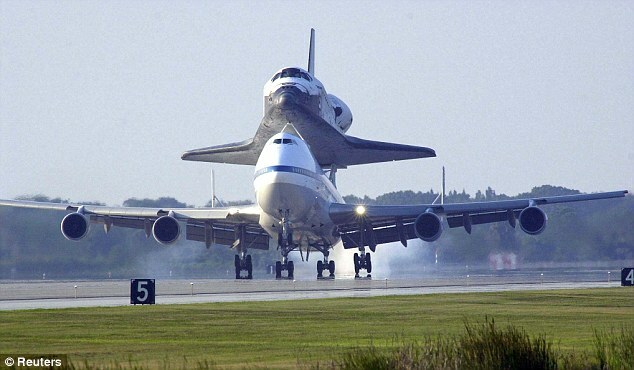 The image above shows the duo flying near the U.S. Capitol and the video below shows views of Discovery from various vantage points in Washington D.C.
Space Shuttle Discovery was hoisted by a giant crane and mounted on a Boeing 747 Sunday for its last ever journey – a piggyback ride to Washington where it will go on display at the Smithsonian Museum. 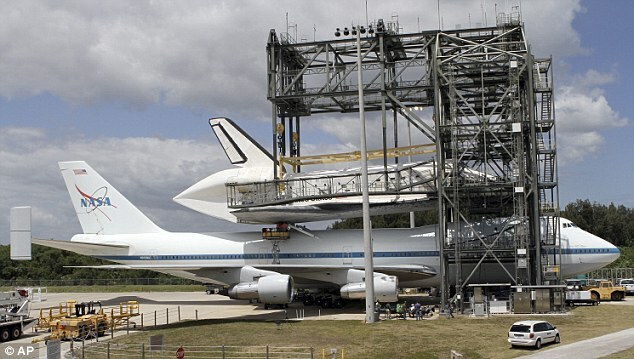 Nasa technicians at the Kennedy Space Centre in Florida had planned to complete the operation early but it had to be abandoned due to high winds. 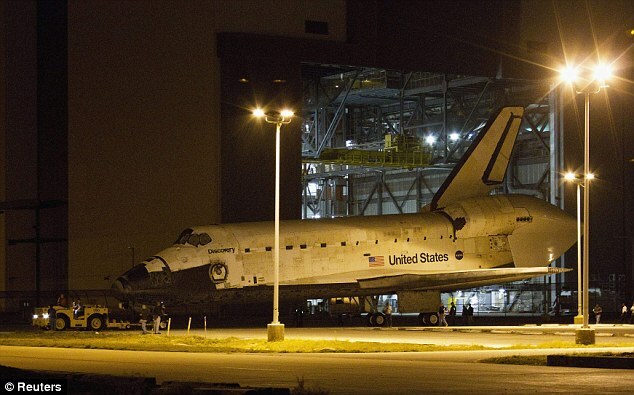 Here’s a video taken by Joy Hargraves who went to the Udvar-Hazy Center today to watch the Shuttle Discovery come in to her final resting place. 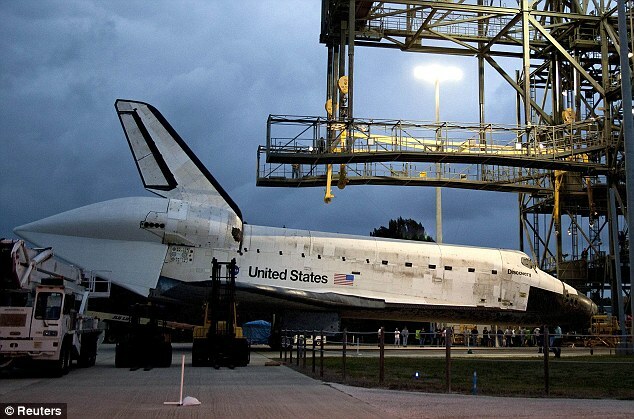 Weather depending: The shuttle was supposed to be mounted last Saturday, but high winds forced crews to call off the operation. 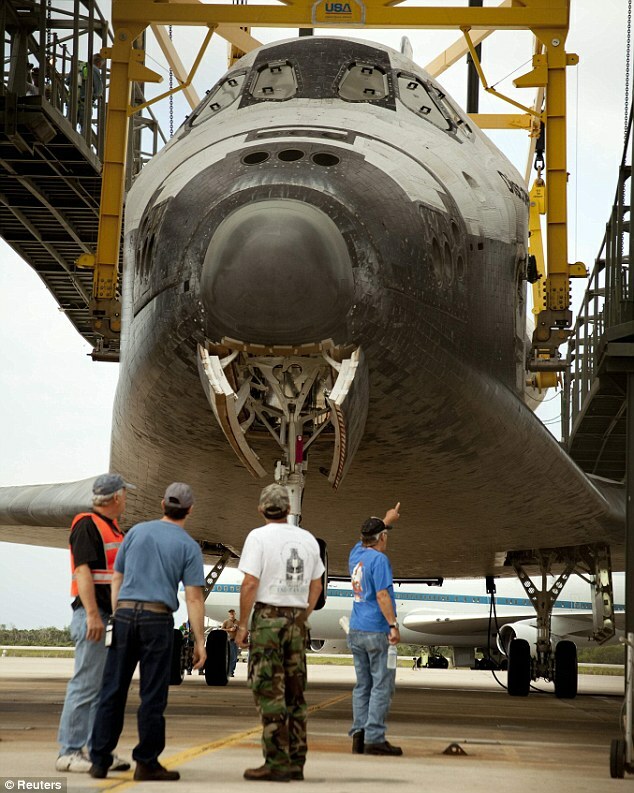 The spacecraft, which first flew in 1984, was retired after its final mission in February last year taking essential parts to the International Space Station. 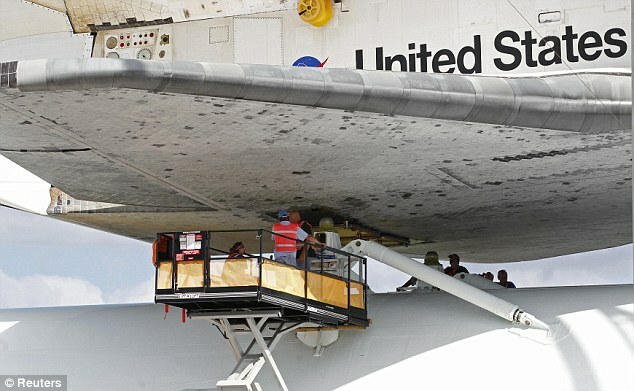 It will replace the Space Shuttle Enterprise, currently on display at the Smithsonian, which will be flown to JFK International Airport later this year and taken by barge to the Intrepid Sea, Air & Space Museum in New York City. 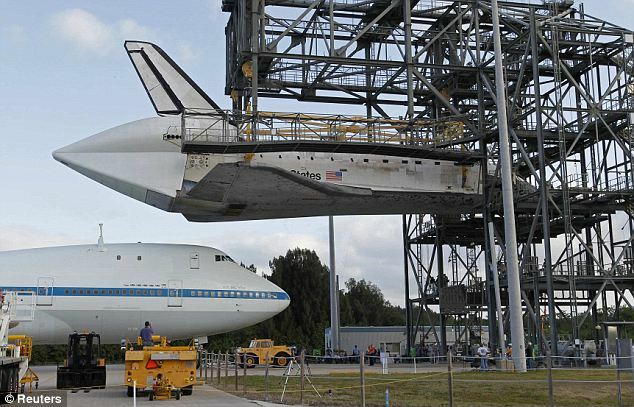 Discovery was towed out of the Kennedy Space Center’s Vehicle Assembly Building and positioned inside crane which is designed to mate it with the specially adapted jumbo jet carrier aircraft. 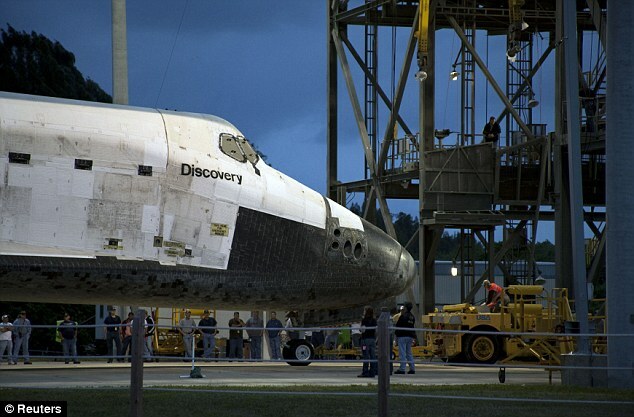 Technicians had managed to attach Discovery the large metal yellow sling and had lifted the shuttle’s nose in preparation for retracting the landing gear before gusting winds caused the 167,000 pound spacecraft to sway. 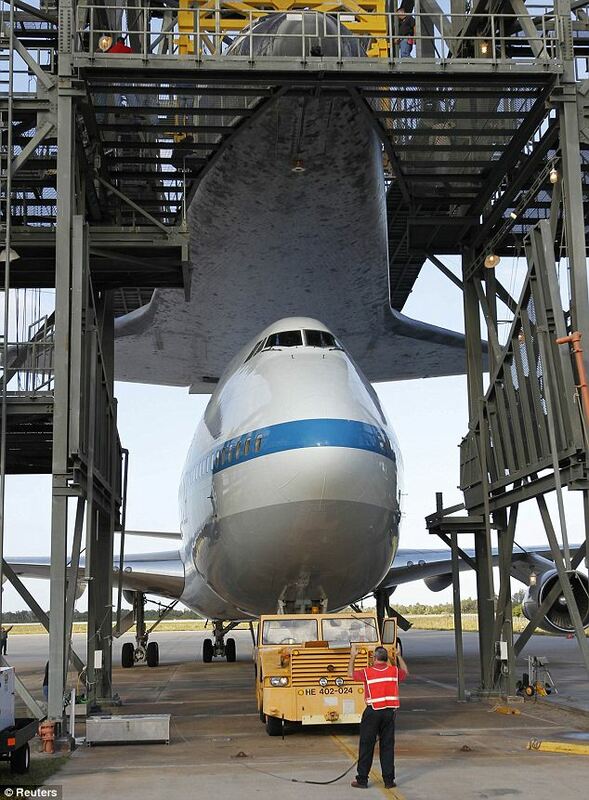 ‘The next step we would have done was lifted the entire vehicle and retracted the gear. We did not get past that point. 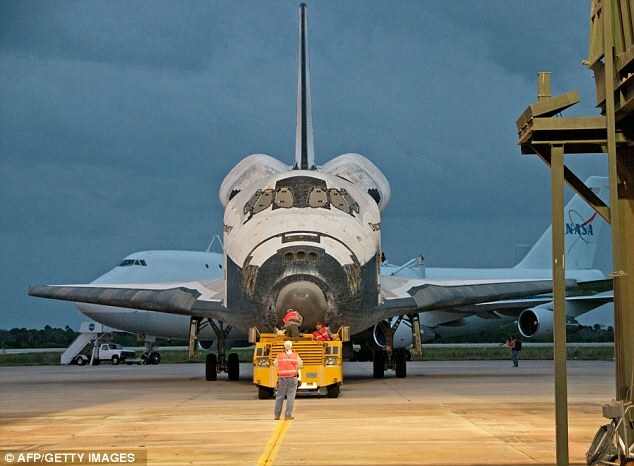 Old girl: Discovery, the oldest shuttle in Nasa’s fleet, has flown a staggering 39 missions over nearly 27 years. 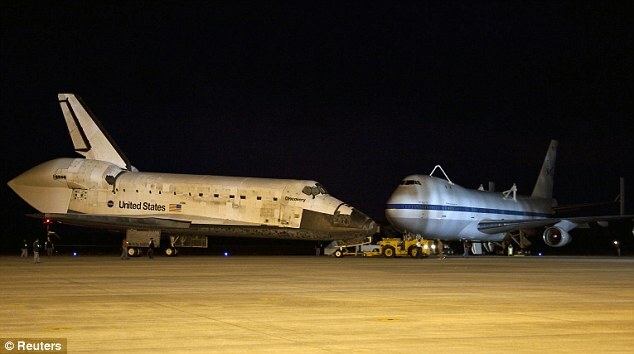 Discovery, the oldest shuttle in Nasa’s fleet, has flown a staggering 39 missions over nearly 27 years. 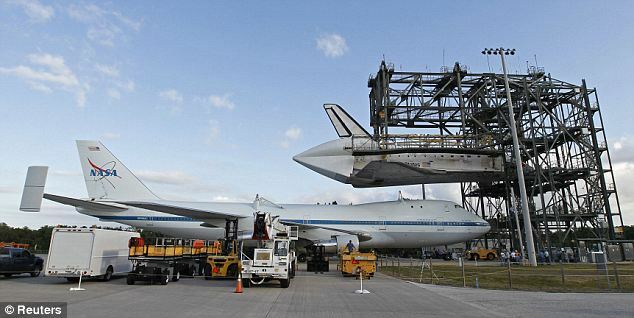 She was stripped of her precious instruments in preparation for her final journey to Washington D.C.
Well, there’s the end of another era. Not sure I’m sorry to see it go. 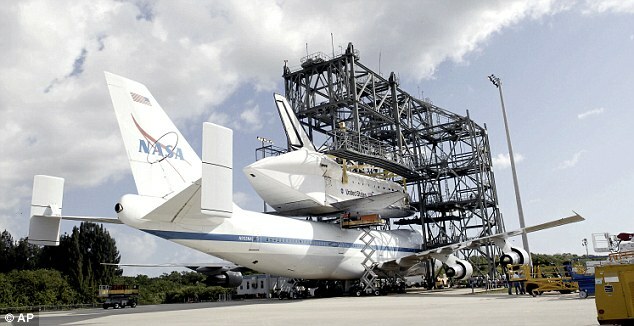 We might move out of Earth’s orbit for awhile after this.